Joanna Quinn and her studio partner Les Mills are winning awards all over the place for their latest animated adventure, “Dreams and Desires: Family Ties”, starring Quinn’s Beryl character. The award-winning new film Dreams and Desires – Family Ties follows Beryl as she explores more about her life and it is seemingly a welcome return to the character who became popular after outings in Girls’ Night Out and Body Beautiful. In the past four months, Dreams and Desires has won 14 major awards and it looks like there are more to come. It’s hard to beat that. 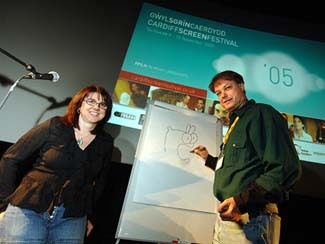 Here’s a picture of Quinn with Bill Plympton. Itâ€™s about time the Dimples team got back to good olâ€™ black and white, hand-drawn, vintage animation. And, thereâ€™s no better way to get there than with Grim Natwick, one of the greatest animators that ever lived. Natwick was a master of every style imaginable. 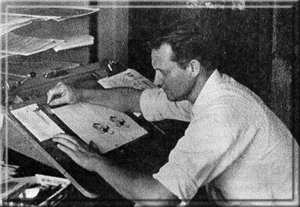 In his long career he worked for Ub Iwerks, Walt Disney where he animated Snow White and the immortal Mickey Mouse as seen in Fantasia, Walter Lantz, UPA and the Richard Williams crew. How was it possible for one person to excel and dominate so many different animation styles? Like many super successful hard working artists, Mr. Natwick lived a very long time. Read this interview done when he was 97 years old. Heâ€™s as sharp as any young man in his mid-twenties could hope to be. What a marvel! He lived to be over 100 years old. His given name was actually Myron but he earned the name Grim for being perpetually upbeat. He was a poet and a highschool football star. In fact, he was such a good athelete that he was invited to the 1908 Olympics. I was recently reading a Daniel Clowes comic that challenged the reader to name one other person’s life that you would like to lead. He said if you did enough research you would find out that no one’s life was worth living. I think I might find Grim Natwick’s life very much worth living.